Consistent but luckless with no less than seven placings since last December, KISS YOUR SONG finally hit the right note with three consecutive wins that took him from Restricted Maiden to Class 4 and now a winner in Class 3. Bought by trainer Shane Baertschiger for A$170,000 at the Ready 2 Race sale, the son of Your Song is now realizing his potential. An easy winner in his last two starts, KISS YOUR SONG had to work overtime to overcome the favourite NOWYOUSEE by a nose after a thrilling tussle over 1100m on the polytrack at Kranji here tonight. "I've always thought highly of this horse, but he’s just had a lot of bad luck. I thought he was on his way out at some stage," said Baertschiger. "He’s had a long campaign with like 10 to 11 runs, but he’s such a tough bugger." 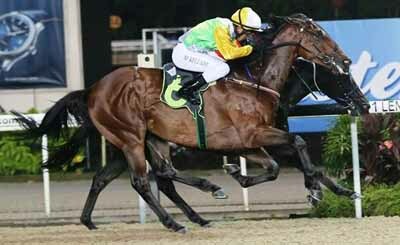 It was a change of luck for jockey Matthew Kellady who had ridden him several times in the past without success. It was also his first win since June 3.